BEIRUT — He was the world’s only sitting head of state wanted for genocide. He lost a third of his country, a quarter of its population and most of its oil resources when South Sudan broke away. Yet Sudan’s Omar al-Bashir, who came to power in a military coup in 1989, was able to keep his grip on power for 30 years in what proved to be one of Sudan’s most brutal chapters. It was not until months of popular protests erupted against him that the 75-year-old president finally lost the support of his military commanders, who arrested and deposed him Thursday. Famous for breaking out in dance and jabbing his trademark cane in the air, al-Bashir exuded defiance even at the most critical moments of his political career. When he was indicted by the International Criminal Court in 2009 on charges of committing crimes in Darfur, he responded by expelling a dozen aid groups working in the war-plagued region, where up to 300,000 people were killed and 2.7 million driven from their homes by militias he backed. Then, he traveled there, appearing at government-organized rallies brimming with supporters. “Tell them all, the ICC prosecutor, the members of the court and everyone who supports this court that they are under my shoe,” al-Bashir said, brandishing a sword. The army then mobilized troops to confront any threat to him and renewed its allegiance to him. Since independence in 1956, Sudan has bounced between tumultuous party politics and military rule. 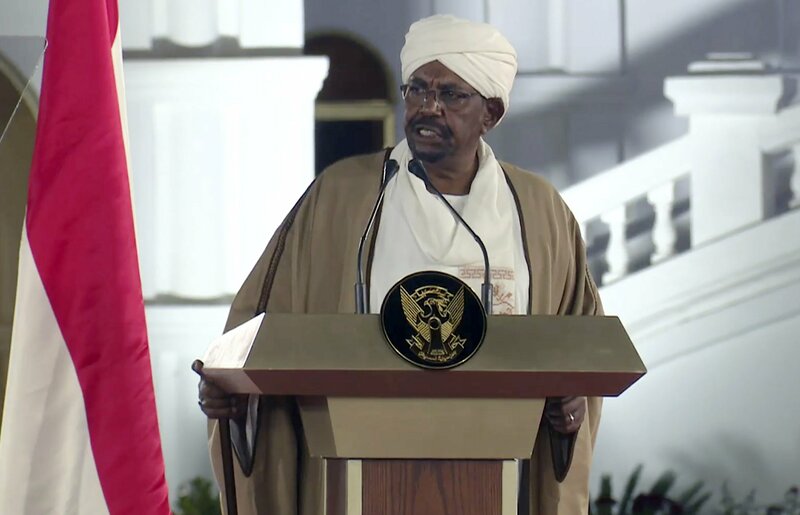 But al-Bashir successfully presented himself as the leader of a new wave of “political Islam,” based on an alliance between Islamists and the military. As a young officer, al-Bashir was groomed and trusted by the Islamist movement, which played a key role in propping him up for years. After leading his coup with a few fellow officers, al-Bashir declared the imposition of Islamic Sharia law. The new rules included stoning and amputations as punishments. Also, Islamic judges were sent to the country’s mainly animist, Christian south, fueling the civil war that was already going on for years. One of his allies, religious scholar Hassan Turabi, invited Osama bin Laden to Sudan in 1991, prompting the U.S. to place Sudan on its list of states sponsoring terrorism. The U.S. later imposed sanctions on the government and carried out an airstrike on a factory in Sudan it said was used by al-Qaida to produce nerve gas. In addition to relying on Islamist ideology, Al-Bashir used the country’s oil wealth to boost a class of businessmen faithful to him and created loyal militias to protect his rule, employing them to crack down on rebels in the country’s western Darfur region. The resulting atrocities led to the charges of genocide. The indictment increased his international isolation but didn’t prevent him from traveling. The strongman even attended last year’s World Cup soccer final in Moscow, taking his place among other heads of state in luxury seating at the stadium. And he paid a surprise visit last December to Damascus, Syria, which has been shunned by other Arab countries because of the civil war there. After years of promising to hold his country together amid disputes with the oil-rich south, al-Bashir quickly accepted the referendum results in 2010 that created one of the world’s newest countries, South Sudan. While criticized, al-Bashir hoped to get concessions from the West in return. Al-Bashir governed with an iron fist while also zigzagging strategically to divide his opponents. He often shuffled his aides, once firing his presidential adviser after accusing him of plotting a coup in 2012, only to bring him back as intelligence chief last year to deal with growing unrest. Then, when the protests persisted, he promised not to stand for re-election, only to renege and run in 2015. “He will be remembered as someone who lied his way in power. He lied a lot,” said Wasil Taha, a Sudanese editor of an English-language newspaper who emigrated to the U.S. This time, the protests, combined with the economic downturn, proved to be Al-Bashir’s undoing. As the pressure mounted, the genocide charges and the threat of being handed over to the International Criminal Court seemed to limit his options.